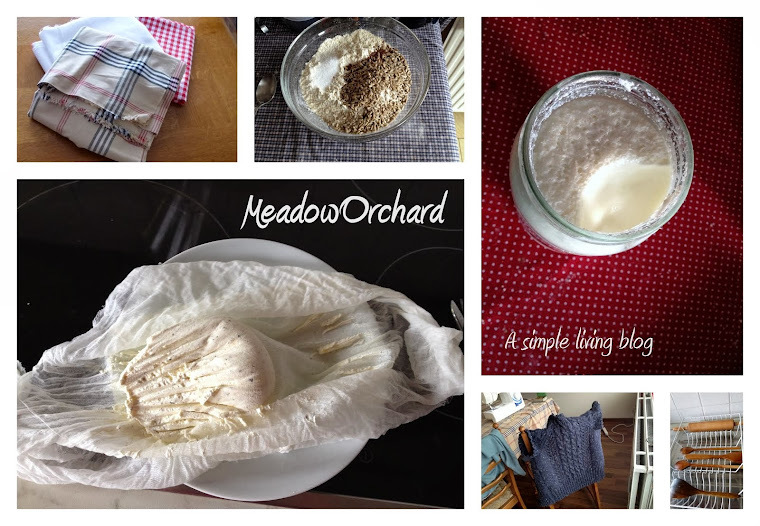 Meadow Orchard: Self-sufficiency: A Disadvantage? While I'm interested in the green movement and would like to think that I live a relatively eco-friendly lifestyle, what really motivates me to take the 'DIY' option is an idea of being self-reliant, of not being dependent on anything I can't influence. This has tied in very nicely with the work I am doing at Imperial War Museum North on clothing in World War Two on the British home front. While my main focus has been on the Utility scheme, I have come across a lot of the Make-Do-and-Mend bits and bobs, including borrowing a reprinted edition of the booklet of the same name. This has contributed to a vague longing to be able to darn my socks. More concretely, it has partially inspired my decision to knit myself a pair of knittens, using double-pointed needles for the first time. (This decision was also inspired by the very cold mornings and my lack of gloves, combined with a limited budget and an availability of cheap wool.) Exploring some of the interactive games aimed at children at the museum, I was thinking today that Make Do and Mend, like more modern Self-suefficiency, is really a state of mind. When something you need is missing, you first see if you can manage without, and if you can't, you improvise with what you have. This is fantastic when it comes to putting together a patchwork skirt like a few I've seen around the city centre in recent weeks. However, less useful in a more mainstream commercial situation. I work at a fairly standard coffee-and-sandwich shop in a train station for most of the week, and there is a perpetual sequence of obstacles, most of which involve someone-or-other having omitted to order something vital, or said item not being available for some other reason. I instinctively react to this situation by assessing what there is in the cupboard, and making something from that. If there's no brie, use mozzarella. However, some of the people at work look at me like I'm an idiot and ask why I didn't just borrow from one of the other coffee-and-sandwich-type places in our vicinity. The change in mindset is great for my personal, private life. Less good for my job. Do you think I can persuade the rest of the world to join me? 'Excuse me, sir, we don't have those baguettes in today. Can we interest you in this weird combination of unusual ingredients which happened to be what we had lying around this morning?